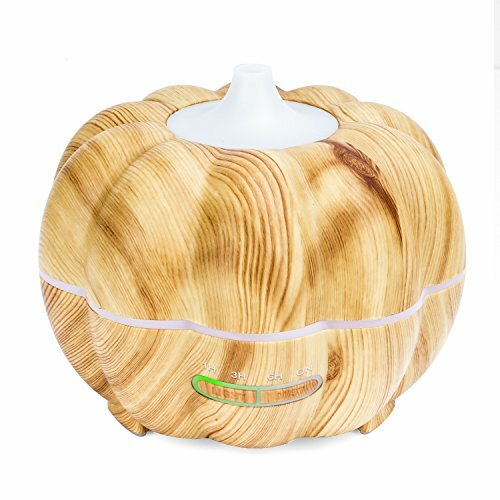 MoKo 300ML Ultrasonic Air Humidifier, Pumpkin Aromatherapy Essential Oil Diffuser with Warm White Night Light Waterless Auto-Off for Office Home Bedroom Room Study Yoga Spa - Wood Color by MoKo at KXSH 365. MPN: 43224-8390. Hurry! Limited time offer. Offer valid only while supplies last. Looking for a simple way to freshen your house? Look no further! This elegant MoKo Ultrasonic Air Humidifier will improve the air quality in minutes. Looking for a simple way to freshen your house? Look no further! This elegant MoKo Ultrasonic Air Humidifier will improve the air quality in minutes. Automatic safety shut off when the water runs out or you can set the timer. Quiet operation ensures tranquil surroundings. Can also be used as a night light. 4. Do not touch any part of the product with wet hand. UNIQUE APPEARANCE - Designed to be a perfect pumpkin decorative piece that fits in with any decor. Also portable for yoga, office, spa, bedroom, baby room etc, can hold up to 300ml water. 3 IN 1 FUNCTIONS - Used as aroma diffuser, humidifier and pumpkin light. An ideal way to add moist to your space and fill with lovely scent by adding a few drops of essential oil. ULTRASONIC TECHNOLOGY - Adopted the latest ultrasonic technology, safer and quieter. Help to moisturize your room quietly, no noisy voice and give you a peaceful aromatic environment. 4 TIMER SETTING - Freely set 1 hour/3 hours/6 hours/steady on mode as you like, greatly eliminate fatigue and relieve mood. Designed with waterless auto-off function for safety protection. ECO-FRIENDLY MATERIALS - Made from the finest quality and no toxic material, provides moisture for dry cough and dry skin especially in the winter. Perfect gift for family and friends.